They are considered indoor/outdoor footwear. Cancellations can not be processed. 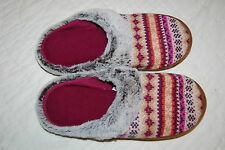 Features: Multi-color stripey design, knit top, gray faux fur trim, indoor/ outdoor sole, machine washable, slip on, no back slippers. 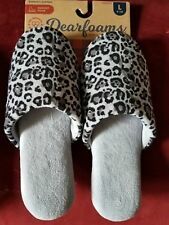 Dearfoams Women's Slipper Size L 9-10 Faux Fur Clog Style. Condition is Pre-owned Great Condition. Hardly worn . Machine washable . Colorful knit front toe,with colors of rust ,pink, Yelliow and some Shiney gold yarn . with faux fur cuff. Clog slip on style Thick black sole bottom From smoke free home. Dress & Formal. Fashion Sneakers. Toe Style: Closed Toe. Save up to 90% on the. Strap Type: None. Closure Type: Slip On. These shoes typically show a little more wear in their soles and may have blemishes such as scuffs and/ or wrinkles. Trending at $20.08eBay determines this price through a machine learned model of the product's sale prices within the last 90 days. Closure Type: Slip On. Material: Synthetic. Heel Height: 1. Size Chart for Dearfoams. Large 9-10. Upper Outer Surface: 100% Acrylic. Design is exclusive to Dearfoams. The space-dye coloration enhances the visual depth, and matching faux-fur trim is a cute and cozy finishing detail. Machine wash. Slip resistant. Machine washable. THEY ARE CLOG TYPE. THESE ARE A SIZE SMALL 5-6. MULTI-DENSITY CUSHIONING SYSTEM.MACHINE WASHABLE.INDOOR/OUTDOOR SOLES. CHECK OUT PHOTOS!! Extra-soft sherpa lining and cushioned memory foam keep the comfort of home close. A non-slip logo sole adds extra support while you relax. The Man-Made outsole lends lasting traction and wear. Manufacturer: Dearfoams. Color: Black Multi. Item color: Black Multi. Material: Synthetic. Size Chart for Dearfoams. Upper Outer Surface: 100% Acrylic. Shoe Lining Material: Polyester. Sole: 100% Thermoplastic-Rubber Machine Wash Cold Water.